This, from the department of self-disclosing dumb things I have done. For a while I had the habit of placing my bikes on top of the car in the Thule/Rocky Mounts/Yakima rack, and then forgetting that there was, in fact, a bike up there. A few years ago, at a local bike shop, when I took my mountain bike in after the headset cracked on a downhill while riding, the guy asked me if I’d hucked the bike off a 10 foot drop or something. “Oh,” I said. I’d been outed. “Yeah, I did. I garaged it,” I said. My riding buddy Ed says that it’s acceptable for every person to garage their bike. Once. After that, he says, you have a stupidity problem. Over the years, I have garaged several bikes. Several times each. I’ve broken a frame, horribly dented and scratched the roof of the car, bent racks beyond repair, and ruined a seat. It’s gotten to the point where I hide the garage door opener in the glove compartment as soon as I strap the bike onto the rack. Or I stand the vacuum cleaner in the middle of the garage, so I can’t pull in. 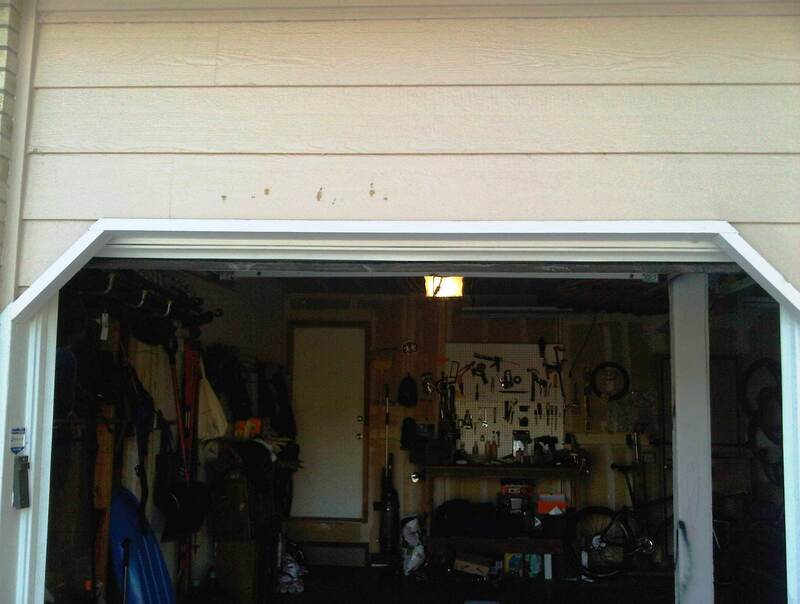 And then, hours later when I open the door, I’m like, who put the damn vacuum cleaner right in the middle of the garage? Maybe I have a stupidity problem. (I see you, dear friends, nodding in agreement.) I blame the fact that I smoked pot all through my freshman year in high school. Killed lots and lots of brain cells, I did, walking the streets of my hometown, listening to The Doors, Van Halen, and Led Zeppelin on a gigantic boom box that my stoner friends and I took turns carrying. Whatever the reason, I have often found myself in space cadet land, forgetting all about that very expensive apparatus on top of the car. Therefore, I must protect my self from myself. PS. In below pic, you can see the tell-tale signs of garaging: several deep marks where the handlebars smashed into the siding. Posted in Crash and/or Break, Random. Previous: Previous post: Is This Going to Live Forever? A garaging incident was one of the most heart breaking relationship moments I have ever witnessed. A woman who worked for me, newly married to an avid cyclist and still head-over-heels in love, drove her husband’s 2-week old custom racing bike into the garage after picking it up for him at the shop. He was so angry that he cancelled their 1-year anniversary trip, saying they “couldn’t afford it now”, pouring kerosene onto the open wound of her unconsollable remorse. And then at a cycling club picnic some months later, he was the one telling this story, still fresh with his wrath, to a group of fellow cyclists, who all looked at him for what he indeed was- an idiot. They all burst out with their own revelations of having done the very thing (even more than once Mike! ), and how he was a fool for his retrobution to her. As I watched this unfold, I remembered seeing her outside my office window, crying into her cell phone as she tried to appease his anger towards her weeks after the incident had passed. I so wished she could have been at this picnic to hear all their stories, their having-come-to-terms-with-a-big-mistake humble perspective. And then to smack her husband with a near-by bike tool. Smack the tool with a tool! Wow, Lisa, that’s good to know I am not the only freak, though a much less judgmental and obsessive one.